All our colour dreams come true with this one! 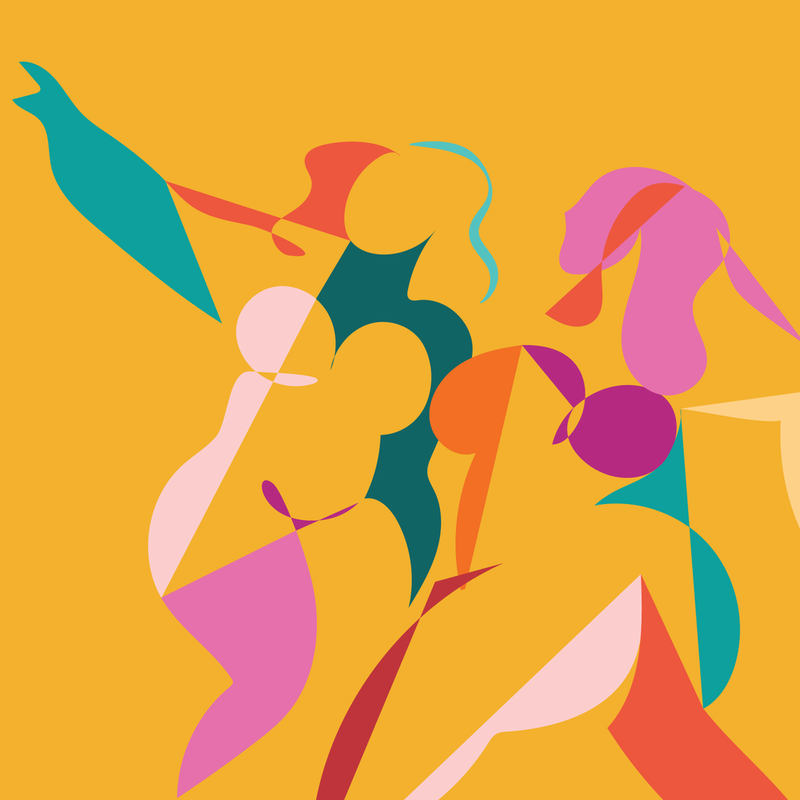 We LOVE the bold lines, beautiful ladies and playful shapes that feature in Marina's work. Her life is just as inspiring - travelling, exploring and challenging herself and her work as she goes (not to mention her killer dance moves). What a woman! Thanks Marina. Be professional and respectful of people’s time. You can do anything as long as you can handle the consequences of that decision. Moving from Brazil to the UK for a couple years when I was a child has really influenced my entire life: language, culture, my tastes and interests. It imbued me with this sense of wanderlust, and at the same time, you have to learn to deal with this sense of otherness – when I moved back home, it made me feel like I never fit in. Deciding to leave home again after university and settle in Barcelona was another massive milestone; I’d come to do a masters degree and was always meant to return to Brazil, but in Barcelona I found myself – learned who I could truly be. It was difficult, as I don’t have a European passport, but completely worth it. I actually studied Architecture in university in Brazil, but found myself lost and unhappy with how sexist and corrupt the industry was after I left school. I moved to Barcelona with hopes of crystallising my ideas, but this was only a couple of years after the 2008 recession and there were no jobs in architecture. I’d been drawing since I was a kid but it took me a long time to realise that illustration could be a viable career; once I did, deciding to “turn my back” on so much time, effort and money spent investing in a career in architecture gave me a lot of angst, but eventually I realised that nothing is in vain, and that my background would only help me in this new path. I’ve never been happier. I would LOVE to design visuals and installations for an event, like a music festival. I’m learning to play the bass guitar, so I’m thinking up crazy ways of combining that with visual design. Maybe something along the lines of this video I made combining dancing and design! I’m also working on the long-overdue print edition of In Shades Magazine, the illustrated fiction platform I co-run with my husband James Vincent, the editor. I’m good at languages! I speak five (Portuguese, English, Spanish, Catalan, Italian) and a half (French). I hope to be as apt with the bass! The first time I saw Van Gogh’s “Starry Night” blew my five-year-old mind. I remember spending a long time trying to recreate that in my childhood, and it still resonates with me. Roaming the fields in Provence that inspired that painting a few years ago was a lovely way to come full circle with it. Also, anime and manga. The Japanese have never had problems portraying sexual and ethnic diversity in their characters, which greatly impacted my formative years. So much stuff! I am completely enamoured with Blade Runner 2049. On TV, I’m watching David Simon’s The Deuce and catching up to Curb Your Enthusiasm, and I’m really excited for season two of Stranger Things. With music, I've been listening a lot to the new releases from War On Drugs, Grizzly Bear and Haim, and I’m obsessed with learning the bassline to Sade and Thundercat songs. I’m currently reading Paul Auster’s New York Trilogy and cannot wait to read Philip Pullman’s The Book of Dust, which is the “equal” to my favourite His Dark Materials trilogy. There are many: Equal pay and opportunity. The things we still have to hear and fight for are alarming but there is a lot of work still to be done. Diversity in the field: design conferences still feature predominantly white males, which is absurd. 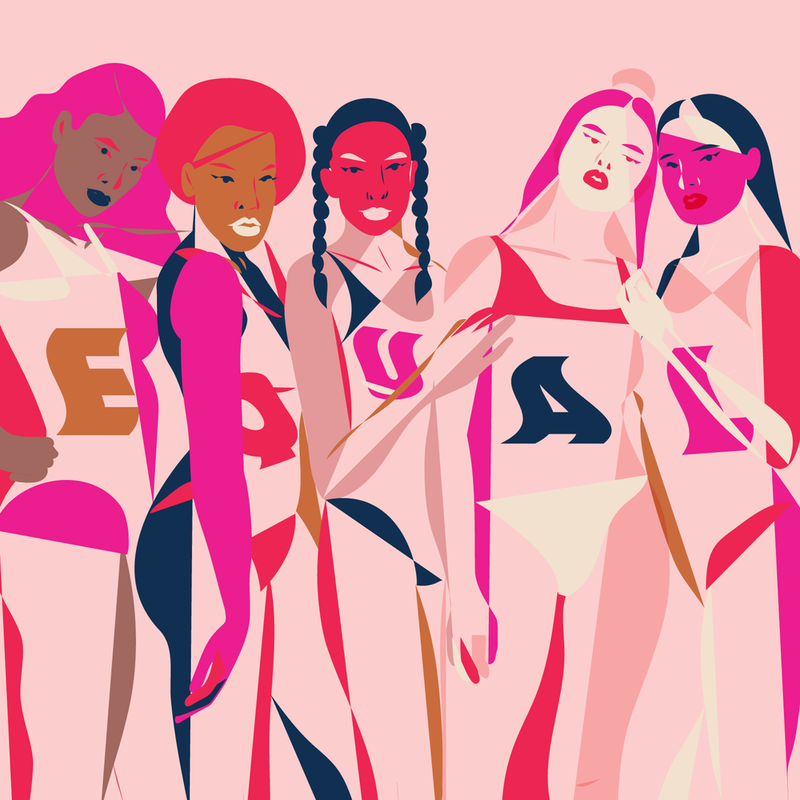 Female leadership within the visual design industries. Like I mentioned before, I truly found myself in Barcelona, so that is really special to me, especially the seaside as it reminds me of my hometown in Brazil, the sunny coastal city of Fortaleza. That is also fundamental as it’s where my family and many dear friends are. And I am often in London for work and family reasons (my husband is from there); it’s where I cut my teeth and where I got my edge, since everyone is so good and you just have to keep up to stay relevant. “There is no free lunch”, which my father has been saying for nearly twenty years. It’s a fantastic way to summarise the fact that every choice has a consequence and one must deal with them. Words to live by. Yes, absolutely. I’m part of many women’s groups locally and internationally, like Ladies Get Paid, Women Who, HER Global Network (through the lovely Petra Eriksson in Barcelona), Her Yeah and Make Nice. The conversations happening in those safe spaces are incredibly nourishing, educating and fortifying. It has definitely had a boom in the last couple of years, and I don’t remember a support system as organised as there is right now, apart from close friends and the women in my family, who were always an example of professional and personal strength for me. Amrita Marino is an amazing Brooklyn-based illustrator that like me switched careers and moved away from her home country. We share the same taste in bold graphics and colours!